The third annual Synthesis Report of the voluntary national reviews (VNRs) is now available. 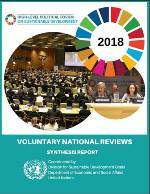 The 'Voluntary National Reviews 2018: Synthesis Report' synthesizes some of the findings of the 46 VNRs presented at the HLPF in July 2018. The report was coordinated by the Division for Sustainable Development Goals of the United Nations Department of Economic and Social Affairs.